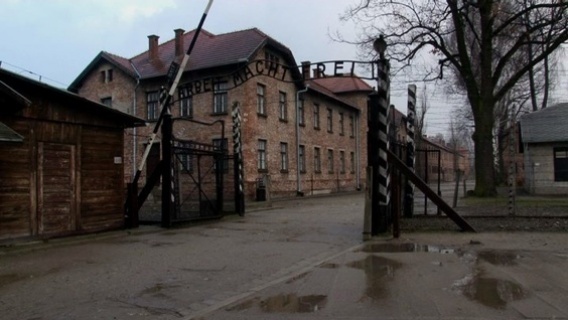 ‘Arbeit Macht Frei’ (‘work makes you free’) must be one of the most infamous phrases in the world. But, I thought, as I filmed at the site of Dachau concentration camp this week, the origin of this phrase is often misunderstood. The words are almost exclusively known because the commandant of Auschwitz, Rudolf Hoess, placed them on a giant iron banner above the entrance to Auschwitz main camp. Here they were to take on the meaning of a black, cynical joke, since ‘work’ most certainly did not make the vast majority of the Auschwitz inmates ‘free’ – in fact, work or the gas chambers killed more than a million of them. But what a visit to Dachau reminds us, is that this was not necessarily how the Nazis originally saw the meaning of this phrase at all. 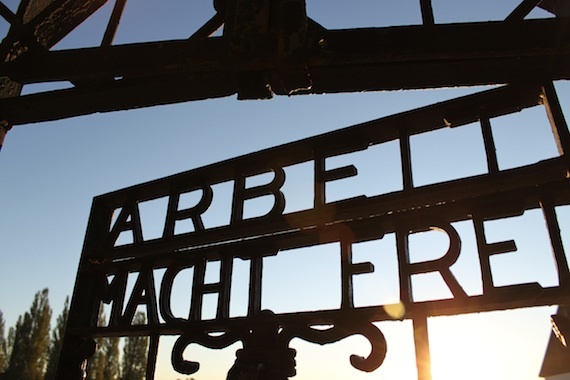 ‘Arbeit Macht Frei’, which was emblazoned on the gates of Dachau in 1936, four years before Auschwitz main camp was constructed, was the title of a nineteenth century novel by Lorenz Diefenbach about the idea of redemption through work. And this notion of the power of work to reclaim ‘degenerates’ was what the most powerful commandant of Dachau, Theodore Eicke, saw as the purpose of concentration camps before the war. The concentration camp of Dachau, outside Munich in southern Germany, established shortly after the Nazis came to power in January 1933, was not designed to murder people en masse – nor were most people who were sent there in the Nazis’ early years Jewish. Most were political prisoners, and though a minority of people sent to Dachau before the war did die there – often after appalling mistreatment by the SS guards – the majority did not. They went into the camp and were, as the Nazis saw it, brutally ‘re-educated’ and then released back into society. Eicke, one of the most gifted sadists who has ever lived, devised a routine designed to break the spirit of the prisoners. Yes, there was physical brutality, but often the worst form of torture was mental. 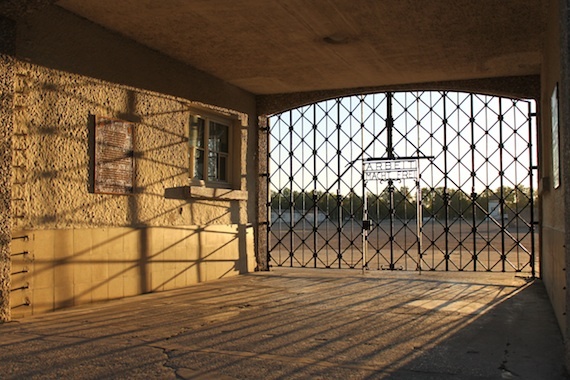 For example, if you were sent to Dachau you were never told when – or if – you might be released. Most prisoners served a sentence of around eighteen months, but some were there for less time and some never regained their freedom. Rudolf Hoess, who trained under Eicke at Dachau, later wrote how this uncertainty played with the minds of the inmates. As a result, Hoess, I believe, thought that the phrase ‘Arbeit Macht Frei’ was almost a ‘help’ – an ‘inspiration’ of you like – to concentration camp prisoners (and remember that Auschwitz was a concentration camp before it became a death camp). Hoess, who had been imprisoned for an act of appalling political violence himself before the Nazis came to power, always remembered how it was the chance to work as a prisoner that had helped get him through his period behind bars. And since concentration camp prisoners were forced to work, then this ‘distraction’ would, Hoess thought, make them ‘free’ inside their minds. There was also, of course, the more obvious meaning to the phrase – if you ‘worked’ as the Nazis wanted in Dachau, behaving as a good German National Socialist Worker, then you did stand a chance, before the war, of being released and ‘free’ from the camp. It’s a reminder that the Nazis were not just brutal thugs. Many of them were extremely clever thugs as well. ‹ Why fight in Italy?